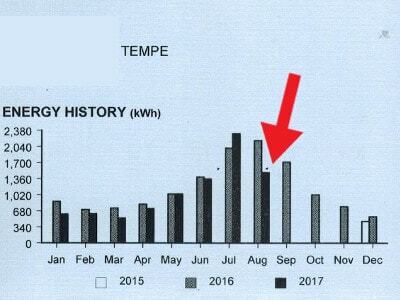 In July of 2017, we did a package heat pump replacement in Tempe Arizona with a brand new Trane system. It was done on an older home with a common style for the area. 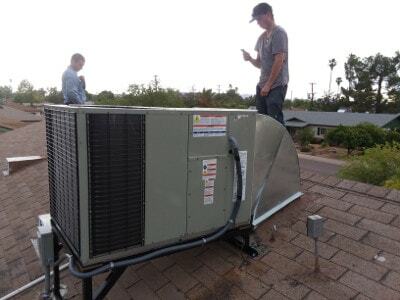 It had an over under transition from the elbow to the ductwork connection so the highest SEER possible was only 14, however, an awesome job was done by our install team and the customer saw energy bill savings immediately. Our technicians started the day early bringing the brand new 14 SEER package system with them, the new elbow transition and all supplies necessary for the install. 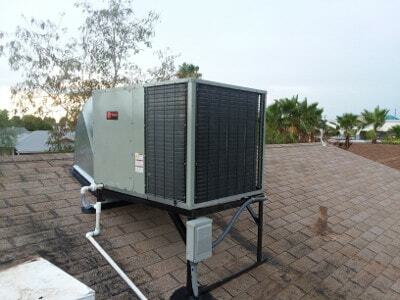 Over under transitions are not common which is why we had to opt for the 14 SEER system. Most systems are side by side. We always do a new elbow and stand for package systems. Our guys hopped right on the roof to take measurements and get a feel for how the unit was going to be placed on the roof. 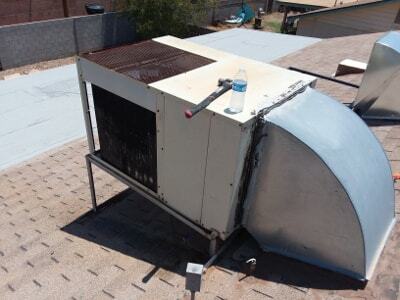 You can see here that the old unit was clearly in poor conditioner and very old. 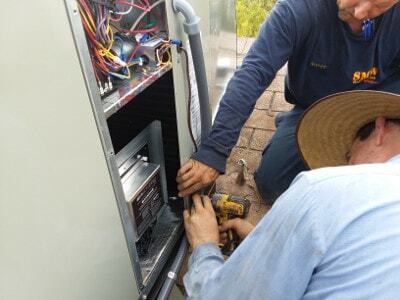 Our guys shut off the electrical and began removing the old unit. This also required them to remove the old drain line and elbow transition. 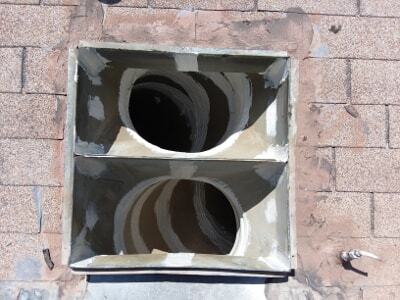 Once our guys got the old elbow off they went ahead and sealed the old ducts from the inside as much as they could. 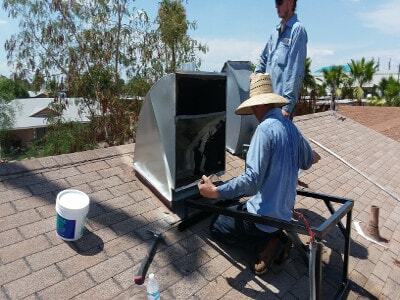 The next step our guys took was placing the elbow transition in place to connect to the ductwork, sealing it, and getting the stand in place, so the new air conditioner will fit right in. In the upper left-hand corner, you can see the new package unit being brought in on a crane. 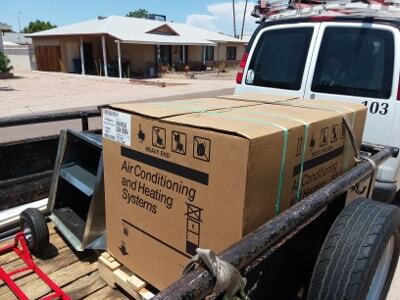 This is common for package units since they are on the roof. 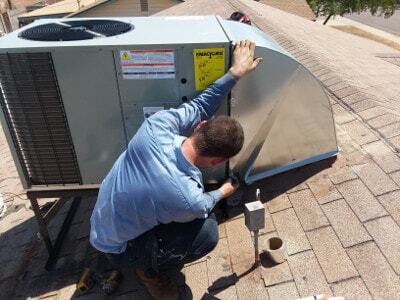 Once our installers were able to get the unit in place with the elbow and stand it was time for them to connect the electrical and drain line. The customer also wanted to have better air quality and we did that with an Activtek Induct 2000 air scrubber to filter and treat the air. 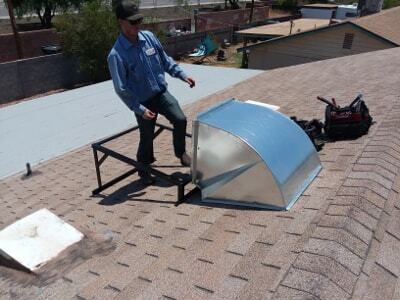 You can learn more about this in the air purification section of our website. 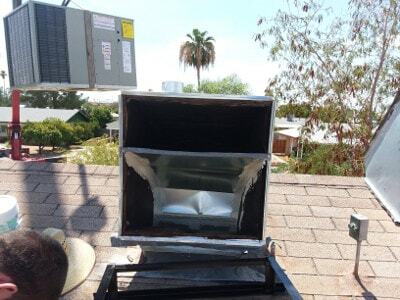 Now that the unit was installed and everything was hooked up on the roof our guys went inside the home to do a new filter grill and call it a day. 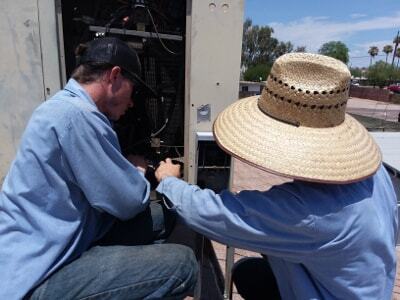 The customer saw electrical usage decrease by 36.7% and is saving about $110 per month.